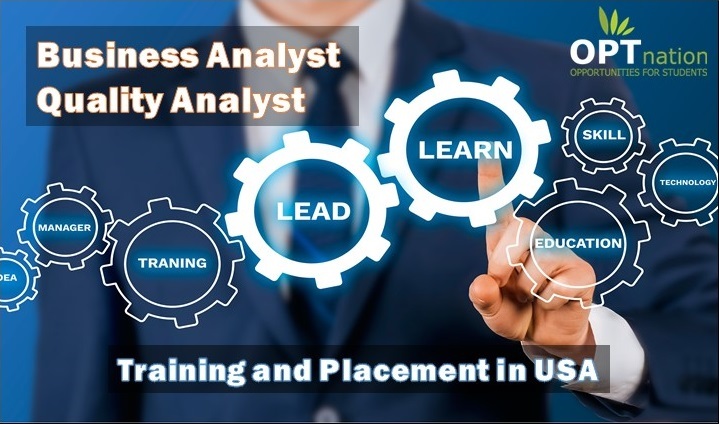 Business Analyst’s work is related to company’s business where the person has to work with client mapping and defining the business requirements. Whereas the term QA means Quality Analyst who develops, executes and test the code for the software and also the working of software. Their duty is to deliver the committed working maintain the ensure quality. The OPT students undertake BA QA Training and Placement because of its high future scope. After taking up the BA QA Training and Placement the students have option to shift from one course to another of their choice. Any time in their career they can have the transition. This expands the growth of opportunities for the student making him closer to business prosperity. With more knowledge about both the fields the student can later take on big and more important projects having new and different responsibilities. The opportunities for students with QA Training would include helping with the transition and implementation process which in turn is a process to fill up the gaps created due to flaw of business analyst. The benefit of having taken the training for both the courses is to be helpful and prove valuable asset to the company in all the forms. The transition to lot of extent depends on the inclination based on the interest and how does one take decision in the time of calamity of company progress. Acquiring training provides stable mentorships which gives strength and knowledge to survive and surpass any kind of situation that may come up in front of business analyst. Training gives the student exposure to participate in various programs and do the case review. Taking part in all the events organized by the training and placement program helps the candidate become a better critic. The student gets chance to deal with errors and face the details raising the questions increasing their experience. It is important to know both business and technology at the same time. If student excels in business then he should gain knowledge about technology and if they already have expertise in technology then learning business will prove to be lucrative. The new testing program continually nourishes the BA QA skills of the candidate. Getting the training and participating in the placement program inserts the candidate between the business team and the development team giving insight of both departments. To be an expert QA the student should have sound knowledge of all the products produced or managed by the company. To advance as a BA the candidate should to know how to deal with project managers, product owners and other BA’s and developers. What role to choose has to be decided based on the self-analysis and the personal interest of the student. Most of Business Analyst or Quality Analyst in their midway change their career path and do the transition; this is both beneficial and has some disadvantages. Scale out the best opportunities and check the conversion success rate before jumping for the change. Undergoing the BA QA training and placement removes the limitation on the career choice from the life of student. The student can leverage business, industry and software domain experience to achieve the aimed career goals. The QA BA training trains a person to act as a link for assistance of communication or cooperation between people. To be an expert the student has to have a communication or cooperation which facilitates a close working relationship between people of organizations. Attending the training program mends the person to be a better liaison. Having immature and blur communication is the biggest flaw which can prove to be a disappointing factor. To let the customers or company manager understand either the product or business fault, the person has to be witty enough to keep the points forward clearly. It is not required to raise the voice and explain but to improve argument and present it wisely. The analysts should never fear of the communication breakdown rather focus on proving points correctly. Students are taught to handle the laden problem giving the optimal solution during their BA QA Training and Placement program. The more resistance is faced the more analytical skills are developed. Every department has business issues and same applies for every newly launched software product. Having the experience of dealing with these issues providing solvable solutions can help reach the high stature. Training also helps the students with the guidance of attending meeting and its behavior patterns. Students are given platform to attend all kind of seminars and conferences strengthening their skills. There are various firms and consultancies which provides best BA QA training and placement programs for students as well as other people who are interested for the same. These firms professionally design the courses in the latest software’s to give candidate’s best guidance form the experienced experts of the field. They have the recruiting team which after the completion of course help candidate in placement assistance according to their profile and skill. The training requires the candidate to be on site and as well as study from online courses. Both the term BA and QA are complimentary. BA and QA team in any company has to work like companions. These positions requires calm person who can be center point of a complex group of interrelated people and being able to handle all kind of roles and processes. The BA job designation is mainly designed to ensure company’s progress value for which they have to keep healthy relation with the people and build network. The company reputation is based on the products design and manufactured which is the responsibility of QA to ensure the best product. Every industry has a QA person or a team whose task is to daily check the quality of service provided and product delivered to the customer. They strictly keep a note about meeting the required standards and commitments. Business Analysts are responsible for analyzing a business domain. Analyzing a business domain involves various activities like understanding the structure, policy, operation of a particular business and defining the requirements for that business. should be on CPT /OPT/GC/L2/US Citizen. Capable of learning new technologies in a fast paced environment. Willing to relocate in US and work as a consultant. Ready to give commitment for at least 1 year. Training and placements for Java, .net, BA, QA, BI Reporting tools, SAP, UI. 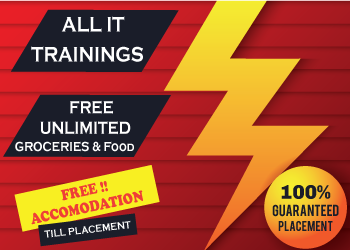 We provide free Traning and placement. Those who are looking for H1 Transfers, OPT/CPT can apply. responsible for establishing and monitoring adherence to quality and testing standards in the development of new media and content management technology projects. Defines, writes, revises, and verifies quality standards and test strategies and procedures to attain quality of applications economically and efficiently. Completes medium to high complexity functions in the evaluation, development, management and maintenance of systems’ testing for business applications.